Derrick and I met nearly seven years ago for the first time, but it wasn’t until two years after that first meeting that we had our first date on Halloween. And a year and a half later on March 7, 2009, we began our marriage. Later that October, we adopted our first “child,” Jeep, the 80-pound chocolate lab. Three years later, our beautiful twins were born on October 20, 2012. I guess you could say that the tenth month of the year is pretty important for us! Me, my mom and sister at my 5-year walk. 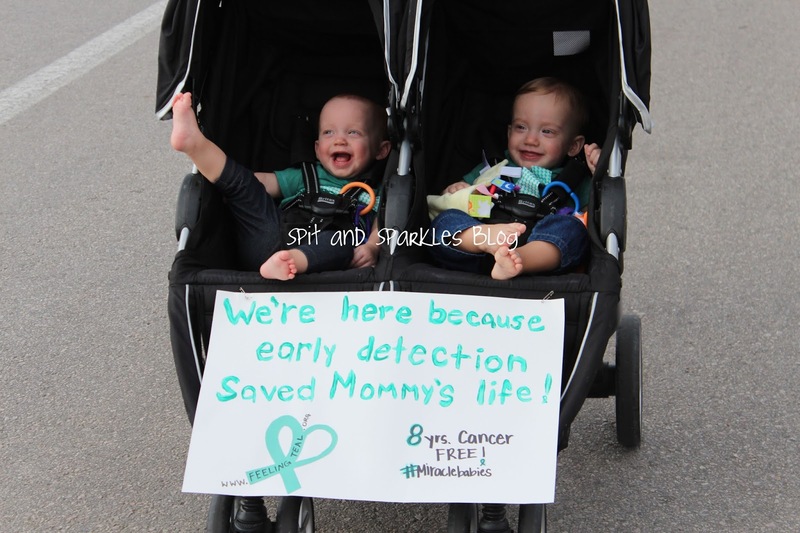 A little bit more about us… I’m proud to be an ovarian cancer survivor of nine years. On June 22, 2005, I was undergoing surgery to remove an ovarian tumor — a surgery that I wasn’t sure I would walk away from and still be able to conceive children one day. I was 19 years old, and I had just completed my first year of college when I was diagnosed with a mass on my right ovary. I was scheduled for surgery immediately to remove the tumor, and possibly both ovaries, or a complete hysterectomy if the tumor was cancer and had spread. Thankfully, the tumor was Stage 1A and confined to the right ovary, and that is all I lost. No radiation, no chemotherapy. God had saved what I knew was my destiny- to be a mother. It wasn’t until many years later, after I married my sweet husband, Derrick, that I fully realized the gift I’d been given, but it also took hardships I never expected to face. After trying to conceive our first child for what seemed like a lifetime, Derrick and I were devastated by our failure. How could God be so cruel, we often wondered. Why did he leave me with one ovary if I wasn’t meant to be a mother? And then after one year of trying, I became pregnant. We were overjoyed, but sadly those feelings were replaced with sorrow just seven and a half weeks later. We learned that our baby didn’t have a heartbeat, and that the pregnancy was over. I remember walking into a store one day, many months later, feeling sorry for myself. I happened to pick up a book at the checkout that consisted of names and their meanings. Curiosity got the best of me, and I looked up my name. Beside it was, what I thought at the time, the cruelest joke ever. Stephanie: Mother of many, happy children. Obviously, since the name was spelled wrong, that was not my prophecy! However, this, I know now, was a sign from God to be patient and trust in His plan. After another year of unsuccessful attempts, we just humbled ourselves before God. We had the elders of our church pray over us and bless us. We cried, and we vowed not to give up no matter what the road ahead had in store for us. A few weeks later, we got the exciting news that I was pregnant, and then we learned that we were expecting twins. Thirty-one weeks later, God’s love and grace were manifested again with the birth of our beautiful baby boy and baby girl. It was with lots of prayer and many people praying for us, that we all made it through the six weeks in the Neonatal Intensive Care Unit. Thankful, doesn’t even describe how I feel. I feel incredibly blessed and humbled and in awe of God’s greatness. Corbin and Lynley are beautiful gifts, and I will never forget what Derrick and I have gone through to get to this point in our lives. I cherish every moment that I get to spend with my little family, knowing that this may never have happened. I have a passion for spreading awareness and began an informational website in 2009 called Feeling Teal. My hope is to one day expand this into an organization that provides support to cancer patients and raises money for research.